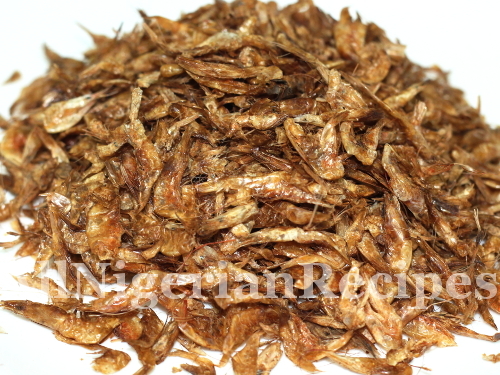 We usually grind crayfish into powder with a dry mill before adding it to Nigerian cooking. Sometimes, you will find it added as is in Abacha and Ugba. There's often a bit of a nomenclature war about what crayfish is. Is crayfish a shrimp, a prawn or even crawfish? 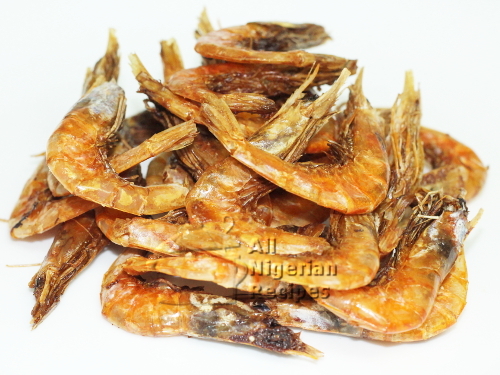 Come to think of it, there's also some confusion when it comes to shrimps and prawns hence they are often used interchangeably in some countries. Based on the characteristics of shrimps, I would say that the crayfish we have in Nigeria are more like shrimps. So crayfish can safely be referred to as dried shrimps. They range from very tiny to large ones that can be mistaken for prawns. In a mound of crayfish, you will mostly find tiny ones with big ones here and there. The big ones known as Oporo are usually sorted out from the rest and sold separately because they are used in a different way when cooking Nigerian food. The procedure detailed below also works for Dried Prawns or Dried Shrimps. Shrimps are usually sold in the frozen section of supermarkets. If you live in a coastal town, you may be able to buy fresh ones from the fishermen. There is no need to add salt because shrimps are quite salty when dry. But then, I don't eat a lot of salt so you can add a tiny bit during step 2 if you wish. Keep the frozen shrimps on your kitchen counter to defrost. This takes a few minutes. Do not use a microwave oven to defrost it. If you have fresh shrimps, skip this step. When done, rinse with cool water and set aside to drain. Set your oven to top and down heating (bake) and 250°C (480F or Gas Mark 9) to preheat. If your oven settings are not up to these numbers, just go with the highest setting possible. Also turn on the oven fan if your oven has it. If not, no worries, it only means that yours will take longer than the drying times stated below. Place the shrimps or prawns (if it's what you are using) on your oven racks. Place in the preheated oven and bake for 25 minutes. Depending on the heating capacity of your oven, this may be less so please keep an eye on it. After 25 minutes, you will notice that they are almost dry. Dab some vegetable oil or any other tasteless and odourless cooking oil eg sun flower oil on the almost dry shrimps. Cover the oven and bake for additional 15 minutes. If your oven does not have a fan, you may need to bake them longer. Again depending on the heating capacity of your oven, it may take less. Overall, just keep a close eye on it from now on. At this point, the crayfish can go from golden eye candy to charred in no time. When completely dry but not charred, take them out from the oven and set aside to cool down completely. Store in a dry air tight container or in your freezer. To use for Nigerian cooking, grind with a dry mill before adding to the dish or as directed in the recipe. Even when stored in the freezer, it does not get damp when you bring it out from the freezer.